(Photo credit: Ed Diller/DiBella Entertainment) By Dan Ambrose: We may have a star in the making in Poland’s Krzysztof Glowacki (25-0, 16 KOs) scoring an 11th round knockout victory over long-standing WBO cruiserweight champion Marco Huck (38-3-1, 26 KOs) last Saturday night in their fight on Premier Boxing Champions on Spike TV from the Prudential Center in Newark, New Jersey. It was a fight of the year candidate with the way both fighters hit the canvas and supplied nonstop action from start to finish. To say that Glowacki vs. Huck stole the show last night from the main event between Antonio Tarver and Steve “USS” Cunningham is putting it lightly. It was no contest. The Glowacki-Huck fight was in another dimension compared to the old timers fight in the main event between Tarver and Cunningham. The 29-year-old Glowacki feels that his victory over Huck will open up the U.S market for him to be a star, which is a definite possibility if he can hold onto his WBO title for four to five years and get a lot of knockouts. However, Glowacki will need to focus on fighting top cruiserweights from outside of the United States because America has very little to offer in terms of top cruiserweights for him to fight. There’s aging fringe contender BJ Flores, who was just beaten, and then there’s Beibut Shumenov. Neither of these fighters are what I would consider stars. Glowacki has got a murderers’ row in front of him in terms of the contenders the World Boxing Organization has lined up for him to fight. His next top contender is unbeaten Ukrainian Olympic gold medalist Oleasandr Usyk, Tony Bellew, Dmitry Kudryshov, and Ilunga Makuba. I wish Glowacki a lot of luck beating all those guys. He’s not going to have to beat them all right away. Glowacki will likely get a couple of voluntary defenses out of the way first against bottom ranked fringe contenders before having to tackle the tough task of trying to beat the taller 6’3” Usyk. That’s going to be a whole different kettle of fish compared to the fight against Huck. Usyk is a big southpaw with technical skills, excellent power, and superb movement. Usyk is not easy to hit and he’s frustrating to fight. He’s got better power than Glowacki and can do all the same things that Huck can do in terms of bullying his opponents and knocking them out with single shots. “The US market is now open to me, and fans around the world are going to have to respect the cruiserweight division now,” Glowacki said. If Glowacki is going to establish himself as a star in the American market like IBO/WBA middleweight champion Gennady Golovkin, then he’s going to need to hold onto his WBO title for a number of years, and he’s going to need to score a lot of knockouts. Both of those goals are attainable because Glowacki has a lot of talent, good power and excellent size. However, Glowacki will need to defeat Usyk, Bellew, Makuba and Kudryshov. That’s going to be really tough for Glowacki to do because those guys can all punch with major power. Bellew is probably the most beatable fighter of that bunch and Glowacki may not even need to worry about him because he’s targeting IBF cruiserweight champion Yoan Pablo Hernandez. The chances are that Bellew will either beat Hernandez to become the IBF champion or he’ll get beaten. Once that happens, he’ll no longer be someone that Glowacki needs to be concerned with. You have to figure that Huck’s management will look to line up a quick rematch with Glowacki so that he can try and get his WBO title back. There will also be a lot of interest from boxing fans in the United State in seeing a rematch between the two European cruiserweights. Before his loss to Glowacki, Huck was trying to accomplish the same that Golovkin has accomplished in opening up the U.S market and becoming a potential pay-per-view star in HBO. Huck, 30, had a tougher road ahead of him than Golovkin though because he didn’t have the same kind of boxing skills and ability to effortlessly KO his opponents that Golovkin has going for him. Glowacki won’t have it easy either, because he’s not the puncher that Huck is, even though he did score a nice knockout last Saturday night. Glowacki’s lack of power means that he’s probably going to need to go the full distance to beat guys like Usyk, Bellew, Kudryshov, and Makuba. Going 12 rounds with those kinds of punchers is going to be difficult for Glowacki, because they’re the type that once they hurt an opponent, they’re very good at finishing them off. Huck had Glowacki down in the 6th round after nailing him with a big left hook to the head, but he wasn’t able to finish him off. 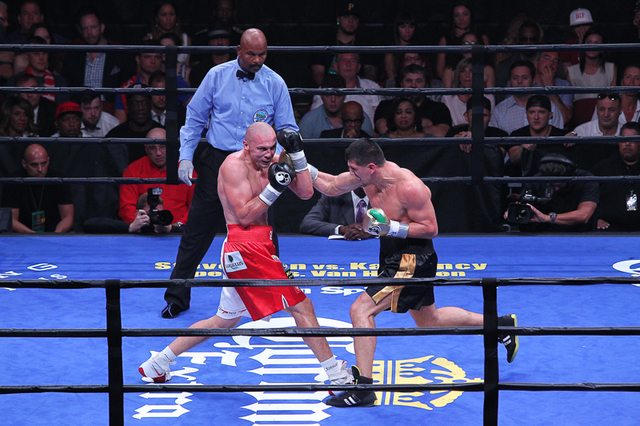 Huck’s follow up attack was very crude and easy for Glowacki to nullify. Glowacki will need to work on his boxing skills more for him to be able to beat the top contenders, and for him to defeat Huck in a rematch. If Huck hadn’t made the mistake of pulling straight back after getting nailed by a left hand from Glowacki, he might have been able to make it out of the 11th round. All Huck had to do was get through the 11th and 12th rounds to get the win. He was up on all three scorecards and on his way to getting the victory. Glowacki does have an exciting style, and it’s quite possible that he can become a star in the U.S. There were a lot of Polish supporters that turned up to see him fight last night at the Prudential Center. There was clearly more Glowacki fans than there were Huck fans. You have to wonder whether that was something that unnerved Huck, because he was so used to fighting in Germany in front of pro-Huck supporters before last night’s fight. It had to have been a much different experience for Huck to find himself fighting in front of a hostile crowd. If Glowacki continues to fight in the East Coast in the U.S. for his future fights, he’ll bring in large Polish crowds to see his fights, and he could do very well. But like I said, it’s going to require that Glowacki be able to hold onto his WBO title for a long period of time and that means he’s going to need to beat all the top contenders the WBO has lined up in their top 10.